Document Express Desktop Edition Version 3.6 now creates DjVu files in the Version 24 file format. We are the first to report this DjVu file format update to Version 24. LizardTech has not published any information about this. In the recent past, LizardTech has provided little or no information about the changes they make to the DjVu file format. 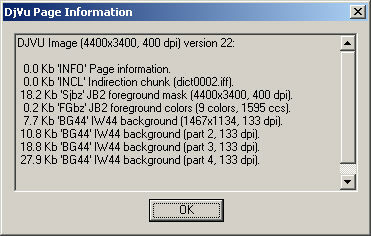 We now take a close, investigative look at the DjVu Version 24 file format update, for your benefit and understanding. We think that the unrecognized chunk "CIDa" is created by the Virtual Print Driver. This unrecognized chunk was not present in previous versions of the DjVu file format. It contains the string "msepdjvu3.6.1" followed by some additional binary information. The exact purpose of the additional binary data and of the purpose of this chunk in general is unknown to us. The DjVu Plugin will always present this message when the DjVu Version is greater than the version stored in the plugin. The DjVu Browser Plugin 3.6.2 has a stored DjVu Version Number of 23. Dr Paul Middleton, Technical Director of TsaAdvet Ltd in the UK has provided two sample DjVu files created with Document Express Desktop Edition Ver 3.6, one with headers/footers, and one without. Links to these two examples follow. He created a Top Left header, a Top Right header, a Bottom Left footer, and he used the Date variable for the Bottom Right footer. He reports that you can add header and footer text for these four positions. You cannot specify the font and point size for headers and footers. You cannot define the position of the text relative to the edge of the page. The header/footer text appears to print by default as Arial, 10-point text. If there is page text or graphics on the page close to the top or bottom edge, the header/footer text will blindly go on top of it. The Top Right and Bottom Right text does not actually print on the right, it prints near the center of the page, regardless of the page size. This looks like a bug. It looks like LizardTech's encoding does not separate the position information (left::, right::) from the displayed string itself. It looks like the formatting of the string breaks the lisp conventions used elsewhere in DjVu annotation layers. We tried printing the DjVu file to Acrobat PDFWriter and to Acrobat Distiller, and in each case the header/footer text failed to render correctly (see the results). We could not see a difference in printing time between the two samples using an inkjet printer, but Paul reports that printing time is slowed down significantly when headers/footers are present. He has observed that when headers/footers are present and he prints to his laser printer, an uncompressed bitmap file (about 26 MB) is first created in a temp folder before the printing commences. This additional step apparently accounts for the printing slow-down. We could print headers and footers with the DjVu Browser Plugin 3.6.2 and with the DjVu Browser Plugin 4.0, with no difference in behavior. As mentioned, we could not see them on the page in either version of the plugin.